The deep structural imbalance in China's demographics has caused complicated and far-reaching social consequences. The low birth rate since the early 1990s has caused a seemingly irreversible trend - the falling number of people aged below 14 years old. This key demographic is dwindling, dropping to 16.5 percent of the population in 2010 from 33.6 percent in 1982. Between 1980 and 1989, there were 220 million births, this number was 172 million from 1990 to 1999 and 160 million between 2000 to 2010. The low birth rate and sub-replacement fertility rate have seriously weakened the structural stability and the sustainable development of China's population. This low birth rate is accompanied by enhancements in medical care and nutrition that has led to longer life expectancy. This has, however, inadvertently led to an increase in the number of elderly people struggling with illnesses in their old age. An aging society and the more pressing issue of sub-replacement fertility rate are the two major challenges China faces now. As more and more developing countries encounter these twin challenges, which developed countries have already experienced, the negative growth in population will become the common future problem for the world. After decades of family planning, China has now fallen into a "low fertility trap" and its population has now entered a period of structural imbalance. This is characterized by a large number of senior citizens, a smaller productive workforce, and fewer adult women and children. More social crises and challenges will follow such a distorted population structure. The traditional notions of fertility that have developed over thousands of years are dying out after more than three decades of state-mandated "birth control." The core values of "carrying on the family clan" were criticized and discarded as an outdated feudalistic ideology. Forced abortions were not rare as a means of compulsory birth control. 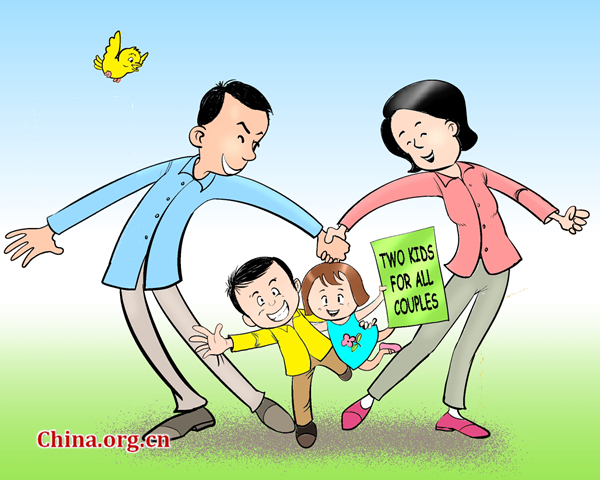 Heavy fines collected from couples who broke the one-couple-one-child policy also pushed many families to the brink of bankruptcy, leaving them to struggle in poverty. The slogan "Have fewer children and raise more pigs" reflects the erroneous value placed on human life by officials during those times. This is just one such example of numerous practices in dealing with population that go against basic common sense. In a society with a healthy demographic structure, it is usually young working adults who support the elderly and the disabled. But low fertility rates have dramatically intensified the pressure that families and society face in caring for the elderly. Because there are fewer younger people, most elderly folks have to take care of themselves. Some disabled pensioners who have enough income for their basic needs can live alone, but others, mostly in the countryside, do not have enough even for basic survival and also lack family and social support. Longevity for these people becomes a kind of punishment. Human care is crucial in an aging society as the elderly need support to help meet their economic and psychological needs. In a fast aging society with low fertility rates, most old people have no choice but to live in loneliness during their golden years. The government should rationally allocate nursing resources to ensure that all elderly, especially the disabled and poor who live alone, are properly cared for. The authorities must also realize that its citizens are the most valuable national asset, and that the demographic balance and the pluralism of the ecology of population must be respected. The government should exhaust every means to keep the demographic balance and promote the optimization of the population structure. The number of people in the working age population demographic, aged between 16 to 59, has decreased by millions every year since 2011. Over the past seven years, China's working age population has fallen by about 20 million, and this is evident in the difficulty in hiring migrant workers in the busy cities. In future, the government must devote more attention to improving the quality of laborers through training and education, which is crucial in stimulating innovation-driven growth. The time has come to provide financial incentives to encourage childbirth and also to enhance the quality of public services to allay peoples' concerns about environmental pollution, medical care, education, elderly nursing and housing. China still has a long way to go to boost its citizen's desire to reproduce and the state must shoulder more responsibility in providing services and guarantees. The author is the Professor of Demography at the Institute of Population Research in Peking University. This article was first written in Chinese and translated by Li Yang. China changed its one-child policy in 2015 to allow couples to have two children but the number of newborns was 17.86 million in 2016 and only 17.23 million last year.